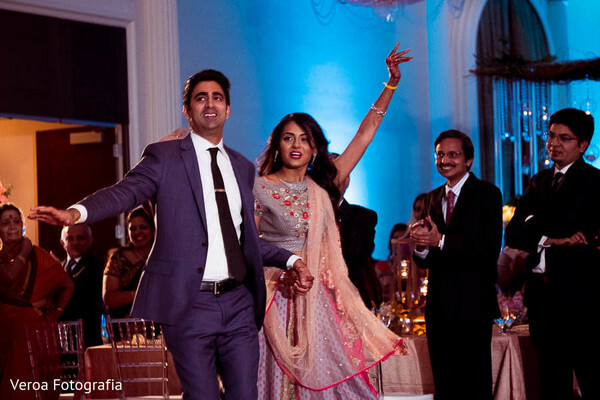 The Hilton Houston Post Oak is the place to be following Maharani Aishwarya and Raja Rajan's Indian wedding ceremony. Their dream day has been expertly planned and designed by the talented Electric Karma International team, and we get to revel in all of their hard work and creativity! Karmadjs gets the party started with the right music and mood lighting, as close family and friends help to welcome the happy couple to their reception. 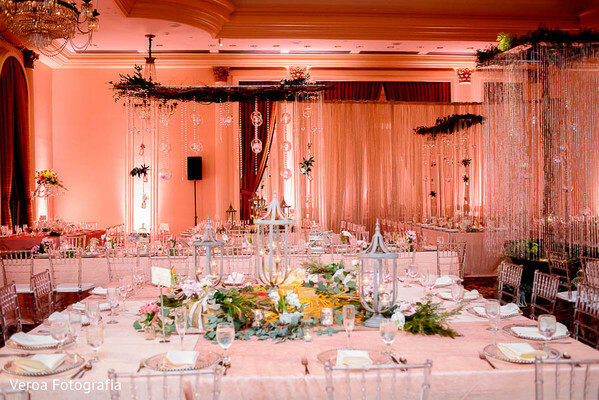 Veroa Fotografia captured these beautiful highlights from the evening, which include the most inspiring floral and decor work by Mandap Creations. 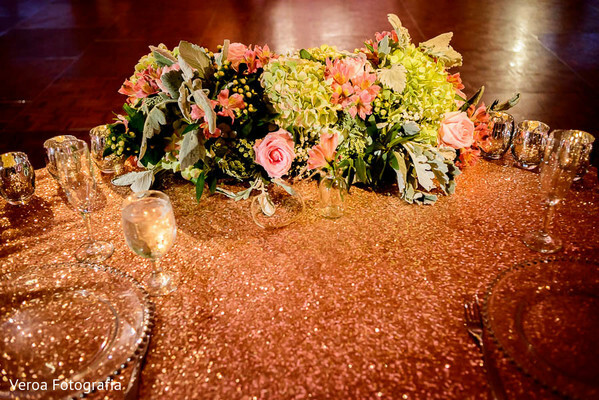 From the perfectly pretty tabletops to the glittering sweetheart table, it's all a dream come true! And the cherry on this totally terrific wedding treat? 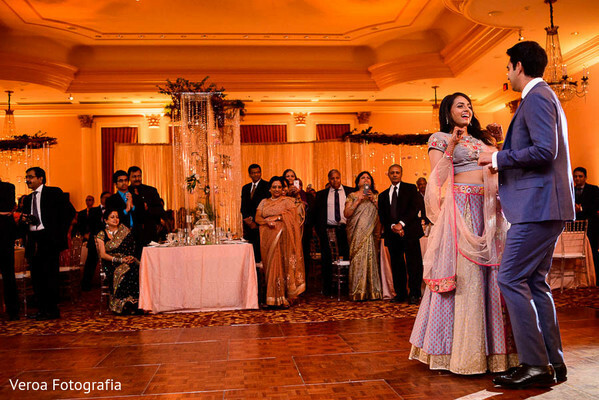 Our Indian bride's incredible reception lengha by Anju Modi! We love the floral embroidery on the blouse and the contrasting polkadots on the skirt! Super playful and Maharani-approved! For more from this delightful wedding event, make your way into the complete gallery. Most of all, it was wonderful to see how many people one wedding brings together - having all of our family and friends in one spot during final stages of planning + the actual day of was incredible special." 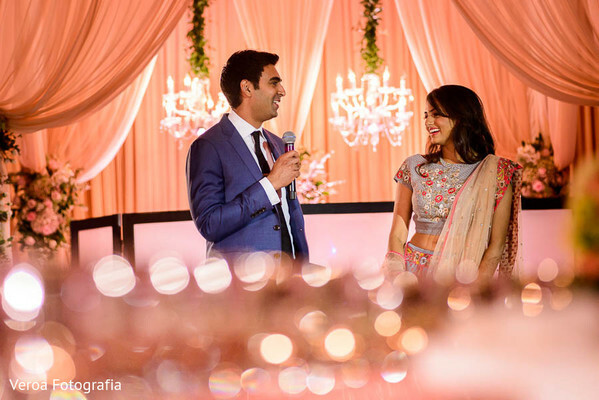 "My reception lenhga was Anju Modi; Anju Modi's pieces blend tradition and modernity exquisitely, and I felt like I was wearing a work of art - I loved my lehnga because it had keys on it, and I thought it played up the whimsical nature of the entire event." "We danced to Luke Bryan's Play it Again. It's a gorgeous country jam - I LOVE country music and I introduced Rajan to it once we started dating." Hope you loved this wonderful Indian wedding event, Maharanis! 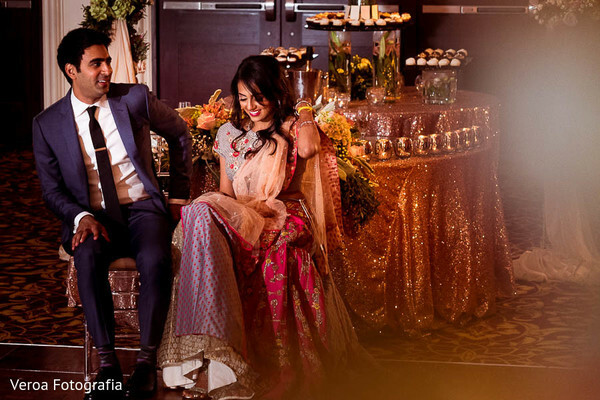 We'll bring you more shaadi inspiration tomorrow to don't forget to check in with us! 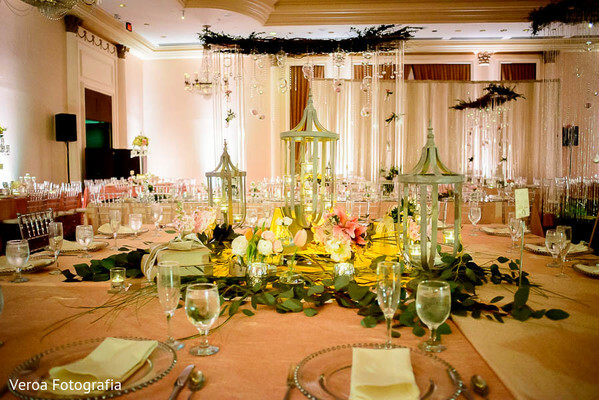 Hilton Houston Post Oak, Karmadjs and Mandap Creations are members of the Platinum Guide. Love what you see? Explore their portfolios.